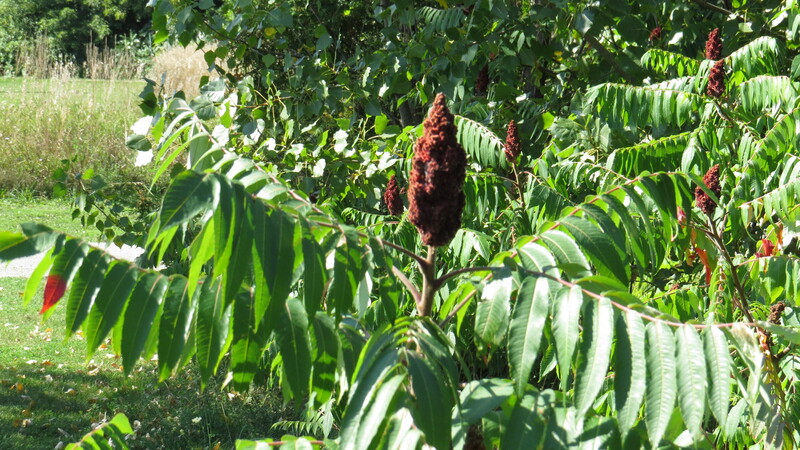 Dear Readers, for the longest time I wondered why people planted staghorn sumac – it’s a small elegant tree, to be sure, but for most of the year the only interest are those fuzzy fruits. 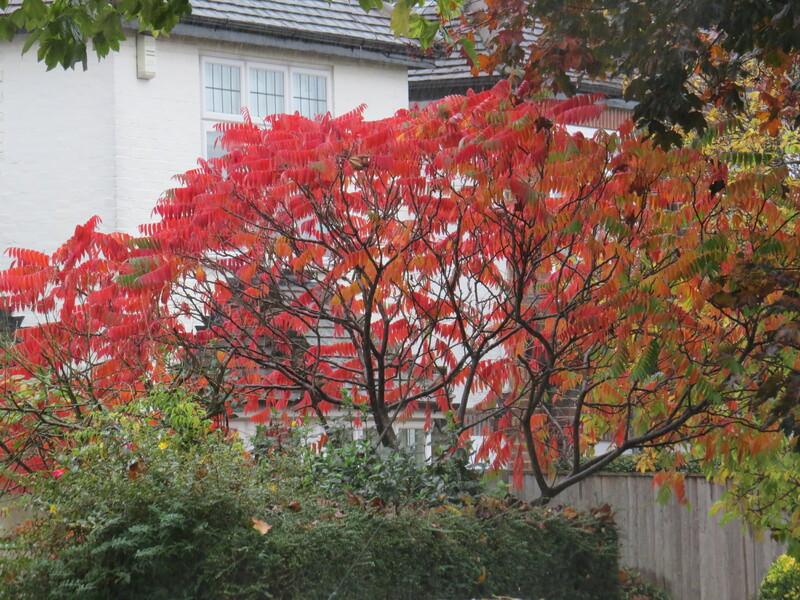 But come autumn, they take on some of the most brilliant autumn colour that you can see around the County Roads in East Finchley, and all becomes clear. These trees are the belles of the ball when October comes around and on a cold, blustery, rainy day like today they stand out like traffic lights. Although all the photos today come from ‘domesticated’ sumacs, you don’t have to look far to see them growing ‘in the wild’. There is a fine stand of them along the railway embankment on the way into Waterloo for example, and they often pop up on wasteground. In ‘Alien Plants’, Clive Stace describes it as ‘a favourite plant that all too soon becomes oppressive, at which point it gets thrown over the garden fence’. He believes that its location alongside railways is probably because these can be difficult spots to eradicate, though the vigorous use of weed killer as I zoom through Wimbledon and Clapham Junction makes me think that Transport for London has redoubled its efforts just lately. For the third week in succession I am featuring a plant that is on the RHS’s list of ‘thugs’ – staghorn sumac largely spreads from a rhizome, but can throw up suckers a fair way from the parent plant, and go grow into dense thickets, crowding out other plants. 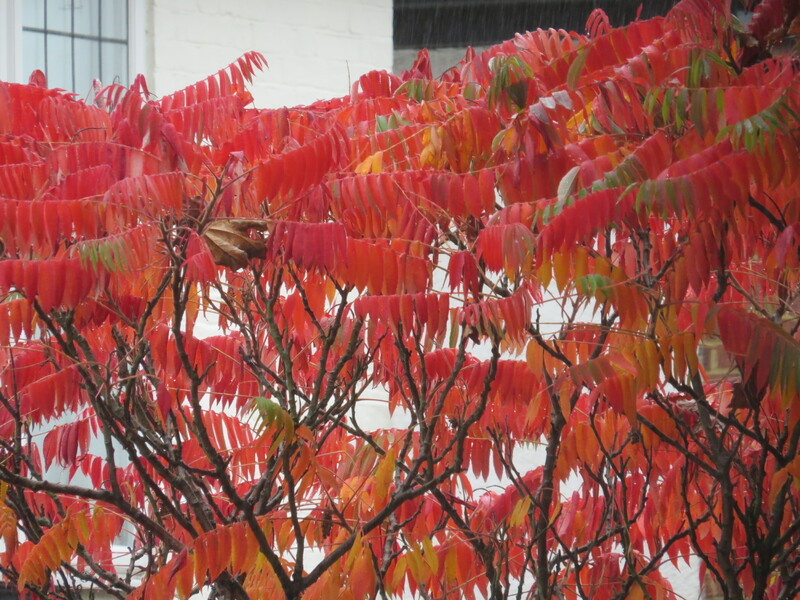 Sumacs are native to the eastern side of North America – I saw them growing wild in Collingwood, Ontario for example. The name’ staghorn sumac’ refers to the hairy stems and and the forking branches of the tree, which resemble a stag’s antlers. They are members of the cashew nut family, of all things, the Anacardiaceae, which also includes mangoes and the marula tree. Marula is an African fruit which is much loved by elephants, but which makes them drunk if the fruit has begun to ferment. I remember a rather lovely cream liqueur called Amarula which was all the rage when I was a student and knew no better. 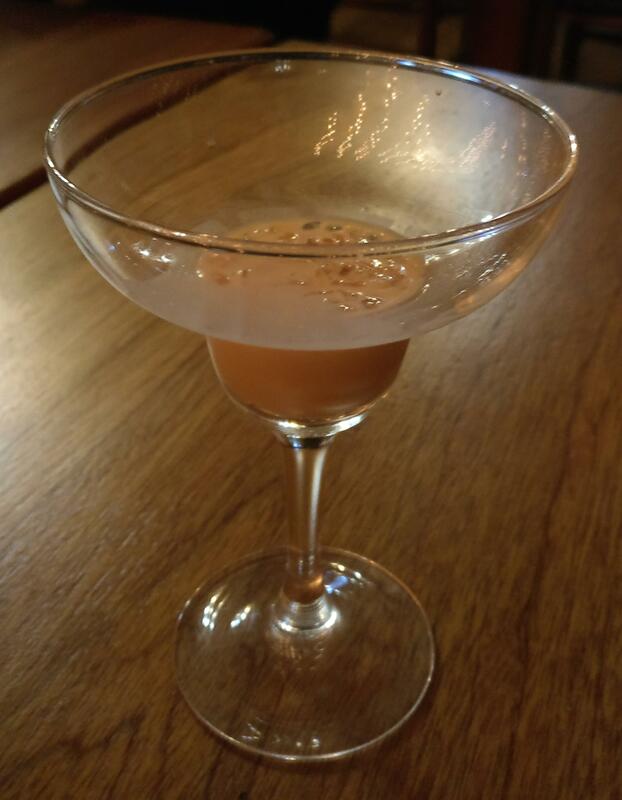 A glass of Amarula (Photo One). You’re welcome. In North America, the leaves and berries of the tree were dried and smoked, on their own or mixed with tobacco. The stems could also be used as pipes, making the plant a handy source of all things smoking-related. 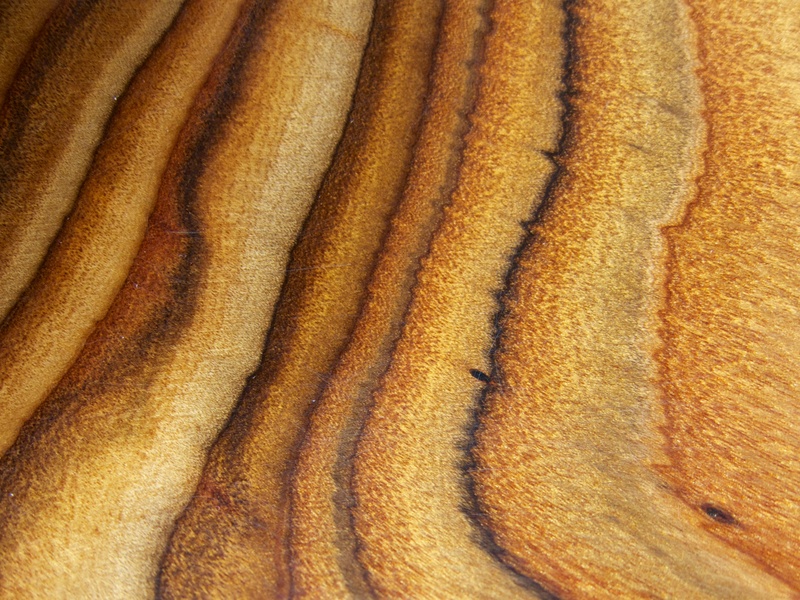 The grain of the wood is exquisite. The strange velvety fruits can be used to make pink lemonade, known as ‘sumac-ade’ and considered both refreshing and health-giving – for a recipe, have a look here.Sumac is a spice much used in North Africa and the Middle East, but this comes from a closely related shrub, Rhus coriaria. In short, choose what colour you fancy, and which part of the plant, and off you go! I am sometimes tempted to have a go at using natural dyes (one of these days when I have a bit more time), do let me know if it’s something that you’ve ever experimented with. 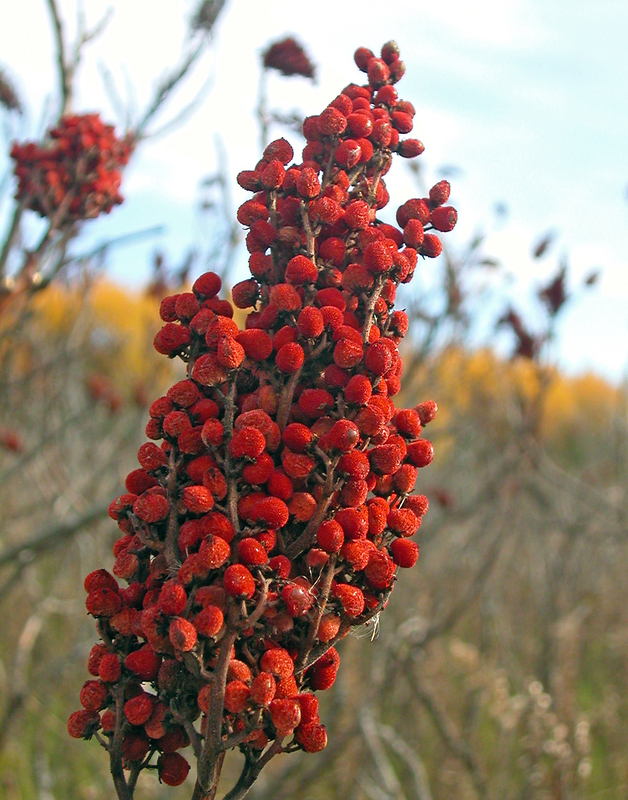 Staghorn sumac is a powerful antioxidant, and the fruits were used by Native Americans for everything from treating sore throats to helping to alleviate diarrhoea. It was a veritable medicine chest, with different tribes using it for different purposes. It was believed to cure venereal disease and tuberculosis, to aid childbirth, to treat stomach upsets and as a general tonic. Some North American tribes believed that staghorn sumac could foretell the weather, although try as I might I cannot work out how. 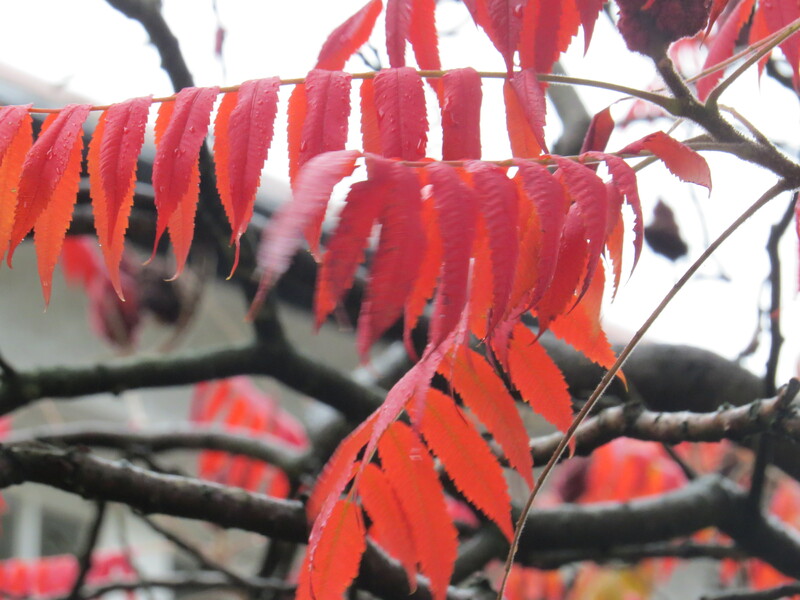 On the Plant Lore website, gardeners in Bromsgrove, Worcestershire seem to believe that planting staghorn sumac in a garden will bring marital strife (though in no other region is this a belief). This is a change from the usual litany of disasters that will occur when a plant is brought into the house, but still. It’s a wonder that anyone plants anything, such are the predictions of disaster for almost everything that you might want to grow. And here, for our poem and to celebrate the season, is a deceptively simple poem by William Wilfred Campbell (1861 – 1918), a Canadian poet who had no doubt seen plenty of staghorn sumacs in his day. I say ‘deceptively simple’ because each line of this poem conjures up an photographic image of a Canadian autumn in the mind’s eye, and because of the air of wistfulness that flavours it. You may think you could knock this up in an hour, but I suspect it ain’t so easy. Anyhoo, see what you think! This entry was posted in London Plants on October 17, 2018 by Bug Woman. I’m sure there is one of these in Vevey, by the shores of Lac Léman. Every autumn it stands out amongst the crowd and is probably photographed as much as the bronze statue of Charlie Chaplin and “The Fork” sticking out of the lake. We also have many similar trees dotted around the Val d’Hérens, which are almost unbelievably red, I’m not sure what they are, but they add that extra splash of colour to the greens, yellows and oranges. It’s a beautiful time of year, but you can sense the temperatures dropping, the days getting shorter and winter snows are just around the corner. I know what you mean about autumn being the gateway to winter – it feels like nature’s last exuberant celebration before everything closes down for a few months. 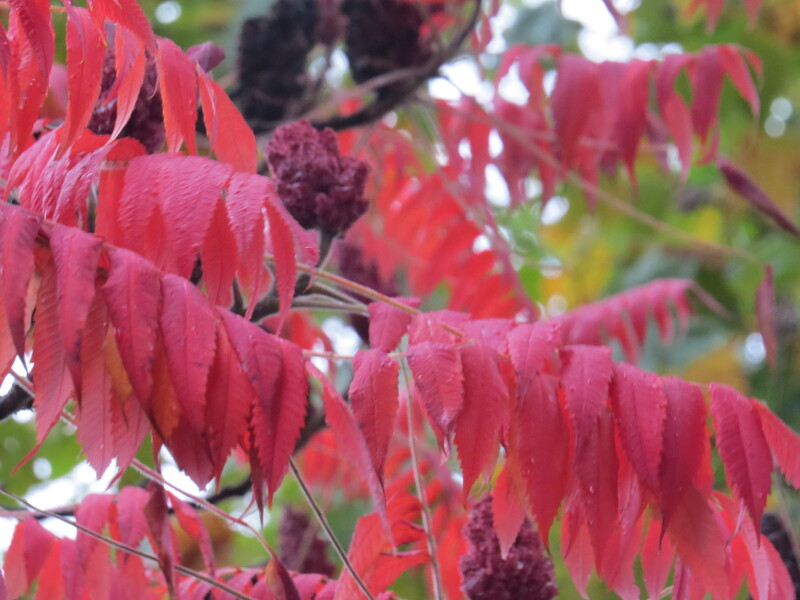 Sumac seems to be a popular topic now that they art coloring. I am not at all familiar with them. I had seen them growing wild in Oklahoma, but they were bare in winter. We have no native specie here, and they are not planted that I am aware of.